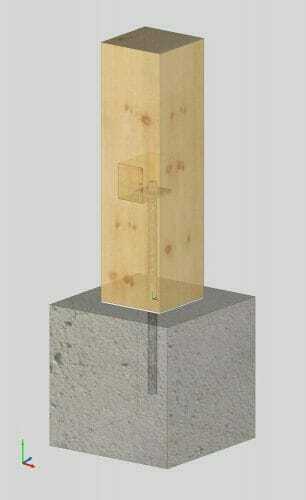 I’m trying to use a 6×6 Timber post instead of a lally column. Problem is I want to put it in before my slab is poured. There is a concrete footing there now but they will eventually pour 4″ of concrete over that. How can I put the post in before the slab is done? I assume its not a good idea to just bury the timber post in the slab? Hi Cory, thank you for your question. You are right in your assumption that you should not pour around the post. Concrete experiences fractures quite often, especially microfractures around points of varying stress (i.e. at the edge of a post). Additionally, any moisture/water that may enter your basement will probably get into the post. These issues combined create a significant rot problem, as water can get to the post and the post is not able to breath, being surrounded by concrete. To remedy this, you will want to look for a post standoff. You can usually cast them directly into the slab/pour, although I believe some of the post bases rely on the compressive strength of the concrete for the vertical support, so if you are planning to build and load the post before the concrete floor is poured I would have a local building inspector confirm that you are using an appropriate post base. If you are interested in how timber posts rot, here an interesting written a little while ago following a demo of a structure that we raised that was encased in a stone veneer, and not allowed to breath. The timber sat with moisture all around it and just rotted away.